The city of West Hollywood is installing a variety of safety treatments on Fountain Avenue as part of a coordinated plan to increase pedestrian, bicycle and vehicular safety. In October 2018, the city’s Department of Public Works added five new high-visibility striped crosswalks to Fountain Avenue at North Harper Avenue, Havenhurst Drive, North Hayworth Avenue, North Formosa Avenue and North Detroit Street. The crosswalks have small refuge islands in the center of the road in order to reduce the exposure of pedestrians crossing and increase motorist awareness of pedestrians crossing. The islands are marked with bright yellow paddle signs, which face lanes of traffic. Additional safety treatments include bulb-outs at intersection corners to reduce crossing distances and enhance pedestrian safety, as well as selected right-turn-only signs in order to reduce potential conflict points. In the upcoming weeks, pavement-embedded lights will be added to the edges of the new crosswalks in order to enhance visibility. The constant movement of dense vehicular traffic and pedestrians in close proximity is an ongoing challenge in West Hollywood and in cities across the nation. The city is continuously exploring a mix of measures to address safety. 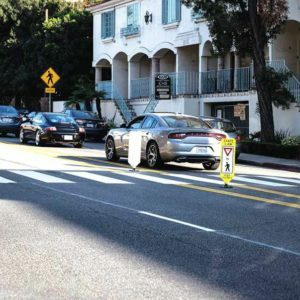 In October 2014, the city of West Hollywood’s City Council approved a plan with three aims to improve pedestrian safety: engineering, enforcement and education. The city of West Hollywood has installed several new signalized pedestrian crosswalks along Santa Monica Boulevard and has added bicycle lanes on Fairfax Avenue. The city has installed solar-powered radar speed indicator signs along Fountain Avenue and on North San Vicente Boulevard in order to remind drivers to drive within the speed limit, and additional radar speed indicator signs will be installed on North Doheny Drive in the coming weeks. In addition, trailer-mounted Electronic Variable Message Signs have been placed at key locations within the city to encourage drivers to slow down and abide by posted speed limits. Los Angeles County Sheriff’s Department deputies from the West Hollywood Sheriff’s Station regularly issue citations for speeding, handheld phone calls, texting while driving, throwing waste out of moving vehicles, driving without headlights, illegal turns, not stopping for pedestrians in the crosswalk and jaywalking, among other infractions. Among other education efforts, the city of West Hollywood has produced “Alice in WeHoLand,” which is a humorous West Hollywood-themed parody of Taylor Swift’s hit song “Shake It Off” conceived by YouTube sensation Todrick Hall. The public service announcement has received nearly two-million views and is posted on YouTube. For information, call the city of West Hollywood’s Department of Public Works at (323)848-6375 or Public Safety Department at (323)848-6414.